How to Interpret an Estimate - ADAMS FARM ANIMAL HOSPITAL, P.A. Consumers place different values on products and services offered at different business institutions, including veterinary practices. 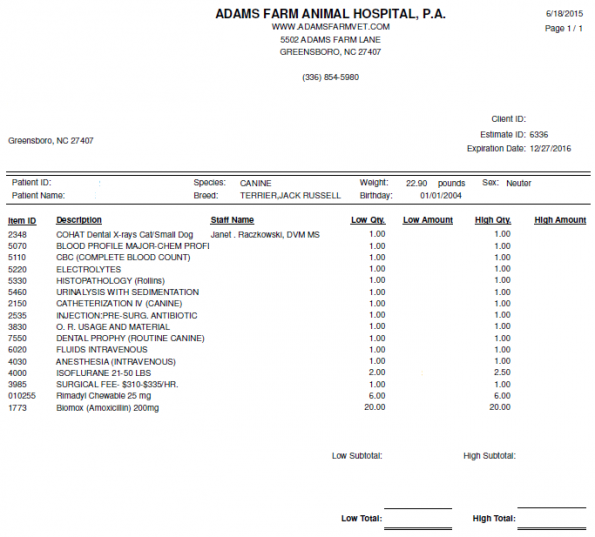 There is no standard of care that is consistent across all veterinary clinics, but at Adams Farm Animal Hospital, P.A. we have developed our own standard of care to provide the best medical services and customer experience for your pet and you. For example, some veterinary practices offer options that pet owners can elect or decline during surgical or anesthetic procedures. At Adams Farm Animal Hospital, P.A. we do not make these services optional because we believe they are necessary to give your pet the best medical care, least stressful patient experience, and lowest risk of adverse events. COHAT stands for Comprehensive Oral Health Assessment and Treatment. Adams Farm Animal Hospital, P.A. dental procedures include full mouth radiographs of all teeth, teeth roots, and sub-gingival bone. We assess the health of the teeth, root canals, roots, gingiva, and bone to look for any signs of infection, tooth or bone loss, or masses that could be causing disease or pain in your pet. The dental prophylaxis procedure includes scaling and polishing of your pet’s teeth with measuring and recording gum health. This allows us to remove any harmful bacteria from your pet’s mouth (tartar and calculus) that can harm the teeth, gums and bone above and below the gum line. If left untreated, these bacteria can cause tooth, gum and bone loss and potentially harm vital organs over time. A full exam of every tooth and the gum around each tooth is also included. This information is shared with you during the doctor to client discharge. A minimum database is lab work that includes the comprehensive blood profile (biochemistry profile), CBC (complete blood count), urinalysis, and electrolyte levels. These tests help us to screen for abnormal organ function (liver, kidneys, pancreas, etc.) and any possible abnormalities with red blood cells, white blood cells or platelets. The health of these systems affects anesthetic risk and procedures may be postponed if elective. This information is also used to help us select the best intravenous fluids for your pet while under anesthesia. An intravenous (IV) catheter and fluids are administered to all pets while under anesthesia at Adams Farm. Anesthesia often affects blood pressure and reduced blood pressure can be dangerous to vital organs. Intravenous fluids allow us to regulate blood pressure during anesthesia, administer medications, and address your pet’s medical needs quickly should it be necessary. During general anesthesia your pet is induced with intravenous drugs and then intubated with an endotracheal tube and maintained under anesthesia with isoflurane (inhalational anesthesia). This allows us to monitor and regulate their breathing while under anesthesia. Each pet is monitored the entire procedure for normal heart rate and rhythm, oxygen saturation (to ensure normal oxygen in the blood), carbon dioxide levels (to ensure that expiration of carbon dioxide is normal), temperature, and blood pressure. These values are monitored by a veterinary technician and recorded in the medical record. The doctor is present during the procedure and makes adjustments as needed based on monitoring parameters. ​You pet may have two needs at one time, for example a dental cleaning and assessment and also a mass removal. The surgical fee and OR usage and material fee cover the costs necessary to perform the surgery and the equipment required. Adams Farm Animal Hospital, P.A. has a dedicated surgery suite where surgeries are performed with aseptic technique, the cleanest environment possible. Caps, masks, sterile gowns and gloves, and sterile instruments are all part of your pet’s procedure. If a mass removal is performed and a biopsy is needed, it may be submitted for histopathology to ensure that the mass is not cancerous. Injectable pre-surgical antibiotics may be necessary to help protect your pet against infection. These are given before the procedure starts to minimize risk. Your pet may also be prescribed oral antibiotics such as Amoxicillin before or after the procedure if needed. Injectable pain medication is required during routine surgeries such as spays, neuters, tooth extractions and mass removals. A combination of opiates, non-steroidal anti-inflammatory drugs, and local pain control in the form of nerve blocks may be necessary to keep your pet comfortable after the procedure. These medications typically last anywhere from 6-24 hours and your pet will likely need oral pain medication at home the evening of the surgery. In this example Rimadyl was prescribed for at home pain control.